Wesleyan University Press, 9780819573650, 276pp. 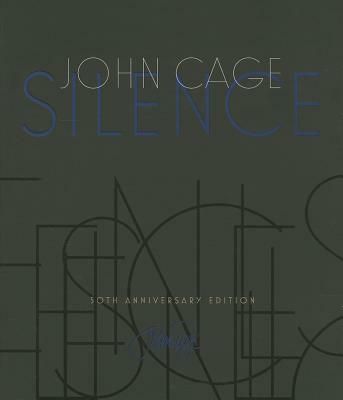 Silence, John Cage's first book and epic masterpiece, was published in October 1961. In these lectures, scores, and writings, Cage tries, as he says, to find a way of writing that comes from ideas, is not about them, but that produces them. Often these writings include mesostics and essays created by subjecting the work of other writers to chance procedures using the I Ching. Fifty years later comes a beautiful new edition with a foreword by eminent music critic Kyle Gann. A landmark book in American arts and culture, Silence has been translated into more than forty languages and has sold over half a million copies worldwide. Wesleyan University Press is proud to celebrate the fiftieth anniversary of the book's publication with this special edition. JOHN CAGE (1912-1992) was an American composer, philosopher, poet, music theorist, artist, printmaker, and amateur mycologist. A pioneer of percussion, chance, and electronic music, Cage was one of the most influential American composers of the twentieth century. He was also instrumental in the development of modern dance in America, mostly through his association with choreographer Merce Cunningham. Cage is perhaps best known for his 1952 composition 4'33," the three movements of which are performed without a single note being played. KYLE GANN is one of the nation's leading music critics. Since 1997 he has taught music theory, history, and composition at Bard College. He is the author of The Music of Conlon Nancarrow, American Music in the 20th Century, Music Downtown: Writings from the Village Voice, No Such Thing as Silence: John Cage's 4'33," and Robert Ashley.